As stunning as this bike is, it vibrates far too much and sadly, this is what I will be remembering from my ride. Not only was my head bouncing all over the place, but my arms were aching from holding onto the handle bars, which ran electric vibrations up my arms and to my neck. I got off experiencing an weird buzzing feeling throughout my body- it was rather unpleasant. Such vibrations only got worse and almost unmanageable when I was below 3000 revs. During these moments, the dash vibrated uncontrollably and it became clear that the bike was only comfortable when it was over 4-5000 revs, resulting in a lot of shifting. Being used to the more flexible boxer engine of the BMW, I found the continuous shifting rather tiresome to be honest and it made the ride unnecessarily hard. Additionally, when I looked threw the mirrors, everything was doubled, which made riding terribly blurry and confusing. I understand that this still occurs of some older bikes, but on a bike of this nature, cost and grandeur, I would expect something far more stable. The bike also kept creeping into neutral and I found particularly hard to put first and second gear in, this I found quite annoying. I also found the suspension to be a little more sporty than I would have liked. It definitely works and handles high speeds well, but it’s a little too hard. I tried to adjust this without changing the power mode, and put it into urban, which did improve the suspension but made the delivery of power quite disappointing. Having said all of this, the bike performs wonderfully. It’s reactive, sharp and quick, something which continues through to the cruise control, which is alarmingly intuitive. This bikes power is truly amazing and its brakes work equally well- thankfully! You can zoom off in seconds and yet bring the bike back to you just as quickly. It is nice to ride around bends and certainly provides that oomph feeling. Although the bike doesn’t sound great on standby, this certainly isn’t the case when you are flowing round open roads or revving it up. Other aspects that I liked were the weather protection, which is fairly similar to the BMW GS with a standard screen and its user friendly menu. Having said that, although some finishing touches work brilliantly and I really liked them, such as the foot pegs which can be changed from enduro to road quite quickly, and the keyless element to the bike, other finishing touches leave much to be desired. Some of the plastic or rubber protectors are quite clunky, with parts getting attached to me and dropping off the frame as I dismounted the bike. Additionally, I found the handlebar was quite high up, which with such a low seat, I found quite straining and comfortable as it forced me into a weird and rigid posture. Overall, it seemed that the bike was quite fuel efficient and it was quite fun to ride. I would have to get used to certain elements such the side stand being quite far back on the bike, but there were certainly parts of the bike which I liked. Would I buy the bike? For this price? No. It vibrates far too much for me, I am not keen on the suspension and fails of the finer details. Having said that, this bike has been on the market for over 2 years now and you will most probably find decent used bikes at a much more reasonable price- then I might consider purchasing one. We recommend Motorcycle News to find good, used bikes. Good honest review, I was disappointed when I tested this bike and I couldn’t see myself commuting on one. Keep up the great work, really enjoy your blogs. Thanks for tithe feedback. I couldn’t see myself commuting on one neither. I think it is a great bike but a bit too aggressive for me. I still think the GS is the perfect all round. Thanks again! I have had a standard 2017 Multi for 18 months and have to say I love it – works for me! 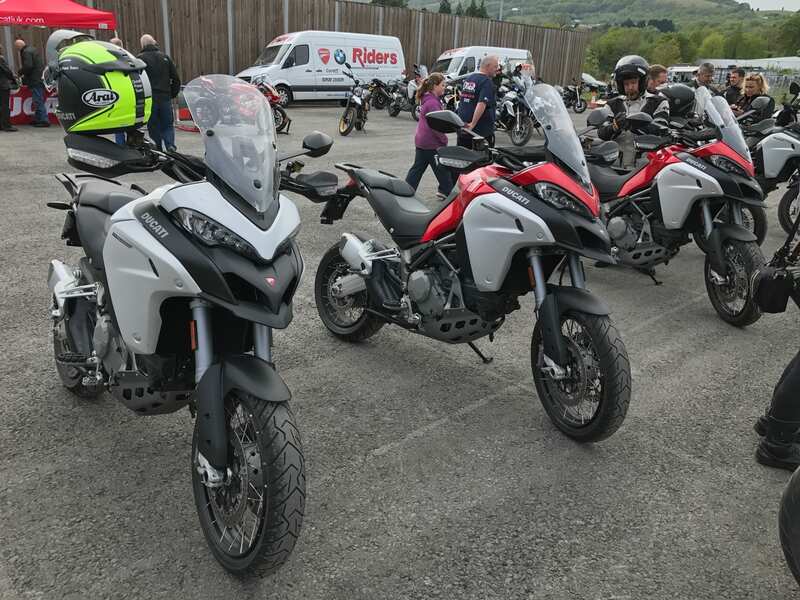 Haven’t ridden a GS or the new Multi 1260 but would bear in mind Inigo’s comments above if I were to think about a new Multi – never say never, but as an Italian not sure i could go the Beemer route. I have to say, I tried the standard 1200 a couple of years ago and I really liked it. For me it is a bit aggressive though. The Beemer suits my riding style better. As always, my advice before buying a bike is to try as many as possible! Only you can say what is right for you. Hola Antonio, gracias por darnos tu opinión. Mis impresiones son basadas en un test bastante corto como explicamos. Nos llevaron muy lentos y tampoco nos dejaron “jugar” a gusto con la moto. También vengo de un tipo de motor distinto más suave y menos agresivo. Me alegro de que estes contento con la moto, yo estoy deseando probar la nueva con el nuevo motor! Hello Antonio, thanks for your opinion. Our impressions are based in a short test ride as mentioned. They took us at quite a slow pace and we couldn’t properly “play” with the bike. I also come from a different type of engine, smoother and less aggressive. I am glad to hear you are happy with the bike, I am looking forward to trying the new one with the new engine!